The Ballarat–Daylesford railway line was a line constructed by the Victorian Railways, branching from North Creswick railway station, near Ballarat, on the Mildura railway line, extending northeast to Daylesford where it connected to the Daylesford railway line. 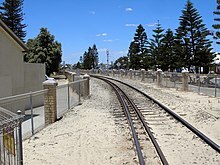 A branch line was opened from Heywood west to Mount Gambier in 1917. Service was suspended in 1995 due to the standardisation of the Maroona - Portland line. There are regular calls for the Heywood - Mount Gambier line to be standardised. Mount Gambier Line. The broad gauge railway line between Mount Gambier and Heywood was used extensively until the mid 1990s to transport timber products between plantations near Mount Gambier to the port of Portland in Victoria.